Three spent boys curl their bodies up under their comforters, surrendering to the exhaustion from the hot summer day. I place the Jesus Storybook Bible back on the shelf, thankful that God’s word is alive and powerful and these boys never tire of reading it. We pray in the dark and I sing my nightly song over them as I kiss them each good night. Then I walk gently, slowly out of their room whispering, “I love you, God Bless you.” They whisper it back. My heart is full. This is just another part of our nightly ritual. It is, perhaps, one of the most precious memories I will have of these days that are passing by too quickly. I return to their room and I give my child the thing he most desires - to be reminded of how much he is loved. With my arms stretched as far and wide as my body will allow, I ask, “How much do I love you?” And together they burst with, “THIS MUCH!” as they also throw their arms wide. I can’t see their faces in the dark of night but I just know their “Jesus” was delivered on a smile. I slip out of their room. I want that one word to linger in the air. I want that name on their lips and in their hearts as they drift off to sleep. Oh how I love that name. The name above every other name. That name that slays me at the most unexpected times. Just the mention of that name - the grace and the love it carries – often overwhelms this sinner’s hearts. I walk quietly down the stairs, giving thanks with each step. Trust me, all of our nights don’t go this smoothly but tonight I’m thankful this one did. I wasn’t a perfect mother today. My kids weren’t perfect either. But we are covered in grace. All of our mistakes, all of our sins, all of our shoulds and shouldn’t haves are buried in the depths of the sea. Because of that one precious name, Jesus, I don’t let the guilt of my mistakes today cling to me. I am free. It wasn’t always this way. I spent many years doing it very differently. Most nights I curled up on the couch, after a hard day, rehashed all of the things I did wrong and wrapped myself up in a blanket of shame. But not now. 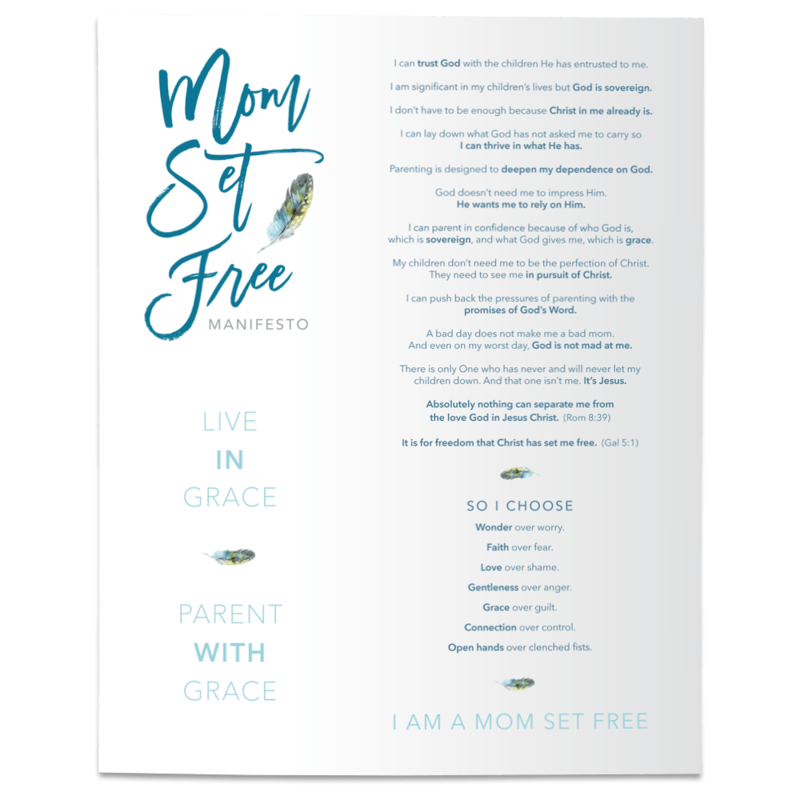 Grace has set me free. It’s been given freely to all of us. Grace, that is. It’s all yours, right now, in Christ Jesus. To let grace wreck you. Let it refresh you. Let it restore you. Let it do it’s transforming work within you. Let it draw you into the arms of that One name. In that One name we will find our hope, our joy, our peace, our everything. Friend, God is inviting you to find your everything in His radical grace for you. And that thing your child most desires - to know how much he/she is loved- is the same thing God most desires for YOU! *** To read more about the grace that is all yours, right now, you can order my newly released book "Parenting the Wholehearted Child."